Coming in January, the kick off issue, INFESTATION 2 #1, will be written by best-selling novelist and comic-book writer Duane Swierczynski and feature art by INFESTATION/INFESTATION: OUTBREAK artist David Messina. This gripping issue sets the stage for Lovecraft's "Old Ones" to break through time and space and invade many titles, including TRANSFORMERS, DUNGEONS & DRAGONS, and a special fifth-week one-shot, INFESTATION: TEAM-UP, featuring Bat Boy and GROOM LAKE's grey alien Archibald in February. 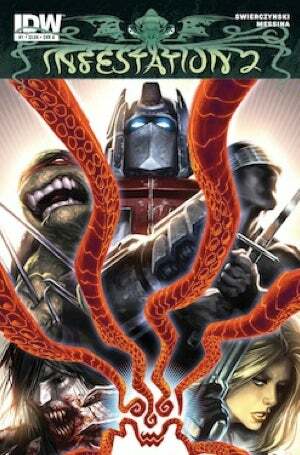 Then in March, the Infestation spreads even further, infecting TEENAGE MUTANT NINJA TURTLES and G.I. JOE. In April, vampires battle zombies in 30 DAYS OF NIGHT: INFESTATION, followed by the stunning closing issue, INFESTATION 2 #2. Of course, licensing issues prevent Donatello from partying with Shipwreck and a gelatinous cube, but Bat Boy! Bat Boy versus H.P. Lovecraft! I have lived to see this day. The first issue of Infestation 2 hits stores January 25, 2012.